For morbidly obese patients, the best way to achieve a significant weight loss is to perform a bariatric surgery as the no- operative means of achieving weight loss have not been found to be effective in them. One of these surgeries is a duodenal switch. Duodenal switch or biliopancreatic diversion+ duodenal switch (BPD-DS) is a highly complicated and most expensive of all bariatric procedures. What is the Duodenal Switch? This is a form of restrictive and malabsorptive procedure. It produces the best result regarding weight loss and resolution of other comorbid conditions. It is commonly referred to as biliopancreatic diversion. 1. Vertical sleeve gastrectomy: removal of about 70% of the stomach along the greater curvature. This leaves a banana shaped portion of the stomach that is fully functional. This is the restrictive aspect of the surgery. 2. The small intestine is then refashioned in such a way as to prevent the pancreatic juices and bile from mixing with the food until the distal end of the small intestine. Since nutrients absorption majorly occurs in the small intestine, the food will remain undigested and unabsorbable until the distal end of the small intestine, thus bypassing a significant portion of the absorptive surfaces. This is the malabsorptive aspect of the surgery. 3. Some surgeons do a prophylactic removal of gallbladder during BPD-DS, as gallstones formation is a complication of rapid weight loss that follows the procedure. Another reason for this is the fact that the biliary tree becomes inaccessible by ERCP after the proceedings. However, this has been found unnecessary and not recommended unless there exists a gall bladder stone before the surgery. The procedure leads to a small sized stomach which implies: early satiety and less hunger as a result of a reduction in ghrelin secretion. The rearrangement of the small intestine leads to reduced nutrient absorption. The indication for BPD-DS is as for other bariatric procedure. A body-mass index (BMI) >40 kg/m or BMI >35 kg/m and 1 or more significant comorbid conditions or weight-induced physical problems interfering with the performance of daily life activities are eligibility criteria for BPD-DS (Pentin & Nashelsky, 2005). This procedure is also performed as a revision surgery when other bariatric procedures failed. How is effectiveness duodenal switch? The duodenal switch has the highest weight loss potential among all bariatric surgeries as it combines both restrictive and malabsorptive procedures. The patient can lose as high as 57kg at the end of the first year of operation, and up to 63kg by the end of the second year (Biertho et al., 2016). In a systematic review carried out by Buchwald et al., the percentage loss in body mass index at 24months post-surgery was found to be 73% (Anderson, Gill, De Gara, Karmali, & Gagner, 2013). One of the advantages of bariatric surgery is the resolution of comorbid conditions associated with obesity. Biertho et al. found a significant reduction in HbA1C (a marker of glycemic control) following this surgical procedure (Anderson, Gill, De Gara, Karmali, & Gagner, 2013). The advantage of this system over gastric bypass is in the fact that the pylorus is intact and able to control the emptying of stomach content into the duodenum. Thus, this patient does not experience dumping syndrome. Also, foods undergo some levels of enzymatic digestion, and the duodenum is still intact making the absorption of nutrient relatively better as against gastric bypass. Despite being the most effective bariatric surgery regarding weight loss and reversal of comorbid conditions, the rate of DS is fast reducing due to the complexity of the operation, its time-consuming nature, the need for a highly skilled surgeon, and the high rate of complications. One of the demerits of BPD-DS is in the irreversibility of the restrictive procedure in contrast to gastric banding BPD-DS has the highest mortality rate in the first 30days post-surgery when compared with other bariatric surgeries (Anderson, Gill, De Gara, Karmali, & Gagner, 2013). BPD-DS is a highly effective bariatric procedure that contains both restrictive and malabsorptive components. 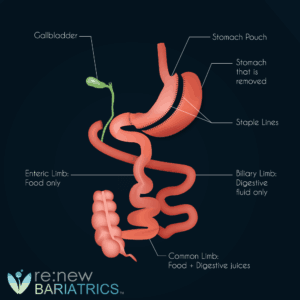 Though the complication rate is the highest when compared with other bariatric procedures, with proper patient selection and in the hands of a competent surgeon, most of the complications can be prevented/adequately managed.